The Symphony No. 3, Op. 36, also known as the Symphony of Sorrowful Songs (Polish: Symfonia pieśni żałosnych), is a symphony in three movements composed by Henryk Górecki in Katowice, Poland, between October and December 1976. The work is indicative of the transition between Górecki’s dissonant earlier manner and his more tonal later style. It was premièred on 4 April 1977, at the Royan International Festival, with Stefania Woytowicz as soprano and Ernest Bour as conductor. A solo soprano sings Polish texts in each of the three movements. The first is a 15th-century Polish lament of Mary, mother of Jesus, the second a message written on the wall of a Gestapo cell during World War II, and the third a Silesian folk song of a mother searching for her son killed by the Germans in the Silesian uprisings. The first and third movements are written from the perspective of a parent who has lost a child, and the second movement from that of a child separated from a parent. The dominant themes of the symphony are motherhood and separation through war. Despite a political climate that was unfavorable to modern art (often denounced as „formalist” by the communist authorities), post-war Polish composers enjoyed an unprecedented degree of compositional freedom following the establishment of the Warsaw Autumn festival in 1956. Górecki had won recognition among avant-garde composers for the experimental, dissonant and serialist works of his early career; he became visible on the international scene through such modernist works as Scontri, which was a success at the 1960 Warsaw Autumn, and his First Symphony, which was awarded a prize at the 1961 Paris Youth Bienniale. Throughout the 1960s, he continued to form acquaintanceships with other experimental and serialist composers such as Pierre Boulez and Karlheinz Stockhausen. During the 1970s, Górecki began to distance himself from the serialism and extreme dissonance of his earlier work, and his Third Symphony, like the preceding choral pieces Euntes ibant et flebant (Op. 32, 1972) and Amen (Op. 35, 1975), starkly rejects such techniques. The lack of harmonic variation in Górecki’s Third Symphony, and its reliance on repetition, marked a stage in Górecki’s progression towards the harmonic minimalism and the simplified textures of his more recent work. Because of the religious nature of many of his works during this period, critics and musicologists often align him with other modernist composers who began to explore radically simplified musical textures, tonality, and melody, and who also infused many of their works with religious significance. Like-minded composers, such as Arvo Pärt and John Tavener, are frequently grouped with Górecki under the term „holy minimalism,” although none of the composers classified as such has admitted to common influences. The Palace in Zakopane; the former Nazi Gestapo prison was where the composer took an inscription scrawled on a cell wall for the composition of his symphony. Górecki now had two texts: one from a mother to her son, the other from a daughter to her mother. While looking for a third that would continue the theme, he decided on a mid-15th-century folk song from the southern city of Opole. Its text contains a passage in which the Virgin Mary speaks to her Son dying on the cross: „O my son, beloved and chosen, Share your wounds with your mother …” (Synku miły i wybrany, rozdziel z matką swoje rany …). Górecki said, „this text was folk-like, anonymous. So now I had three acts, three persons … Originally, I wanted to frame these texts with an introduction and a conclusion. I even chose two verses (5 and 6) from Psalm 93/94 in the translation by Wujek: ‘They humiliated Your people, O Lord, and afflicted Your heritage, they killed the widow and the passer-by, murdered the orphans. '” However, he rejected this format because he believed the structure would position the work as a symphony „about war”. Górecki sought to transcend such specifics, and instead structured the work as three independent laments. The symphony is constructed around simple harmonies, set in a neo-modal style which makes use of the medieval musical modes, but does not adhere strictly to medieval rules of composition. A performance typically lasts about 54 minutes. Ronald Blum describes the piece as „mournful, like Mahler, but without the bombast of percussion, horns and choir, just the sorrow of strings and the lone soprano”. The work consists of three elegiac movements, each marked Lentoto indicate their slow tempi. Strings dominate the musical textures and the music is rarely loud—the dynamics reach fortissimo in only a few bars. The symphony is scored for solo soprano, four flutes (two players doubling on piccolos), four clarinets in B♭, two bassoons, two contrabassoons, four horns in F, four trombones, harp, piano and strings. Górecki specifies exact complements for the string forces: 16 first violins, 16 second violins, 12 violas, 12 cellos, and 8 double basses. For most of the score, these are in turn divided into two parts, each notated on a separate staff. Thus the string writing is mainly in ten different parts, on ten separate staves. In some sections some of these parts are divided even further into separate parts, which are written on the same staff, so that ten staves are still used for a greater number of parts. Unusually, the score omits oboes, English horns, bass clarinets, and trumpets. The bassoons, contrabassoons, and trombones play only in the first movement, and only for a few bars (bassoons and contrabassoons: 339–342 and 362–369; trombones: 343–348 and 367–369). After the 8-part canon is played, it is repeated, with the 1st parts of the 1st and 2nd violins (silent up to this point) doubling the other violin parts an octave higher. The canon ends, with all the strings (except the double basses) ending on a single note, E4. The movement thus ends with the lower strings, and the piano (briefly recalling the second section of the movement). The movement opens with a folk drone, A–E, and a melodic fragment, E–G♯–F♯, which alternate with sudden plunges to a low B♭–D♭ dyad. Thomas describes the effect as „almost cinematic … suggest[ing] the bright open air of the mountains”. As the soprano begins to sing, her words are supported by the orchestra until she reaches a climaxing top A♭. The movement is resolved when the strings hold a chord without diminuendo for nearly one and a half minutes. The final words of the movement are the first two lines of the Polish Ave Maria, sung twice on a repeated pitch by the soprano. O sing for him / God’s little song-birds / Since his mother cannot find him. And you, God’s little flowers / May you blossom all around / that my son may sleep a happy sleep. The orchestra returns to A minor before a final postlude in A major. In Górecki’s own words: „Finally there came that unvarying, persistent, obstinate ‘walczyk’ [on the chord of A], sounding well when played piano, so that all the notes were audible. For the soprano, I used a device characteristic of highland singing: suspending the melody on the third [C♯] and descending from the fifth to the third while the ensemble moves stepwise downward [in sixths]”. 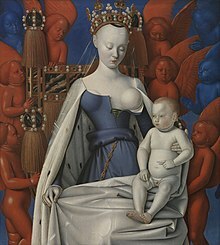 Jean Fouquet, Madonna and Child, c. 1450. The symphony alludes to each of the main historical and political developments in Poland’s history from the 14th century to 1976, the year of its composition. What is more, each of the three movements appears to represent a different age . . . and [they are] chronologically contiguous. The composer seems to have created three separate and discrete „chapters” in his summary of Poland’s history. Górecki said of the work, „Many of my family died in concentration camps. I had a grandfather who was in Dachau, an aunt in Auschwitz. You know how it is between Poles and Germans. But Bach was a German too—and Schubert, and Strauss. Everyone has his place on this little earth. That’s all behind me. So the Third Symphony is not about war; it’s not a Dies Irae; it’s a normal Symphony of Sorrowful Songs.